Ever since I first rode my bicycle down Locust Street East from Theresa (as a SLU student and Grand Center resident) I have considered this area one of St. Louis’ coolest. 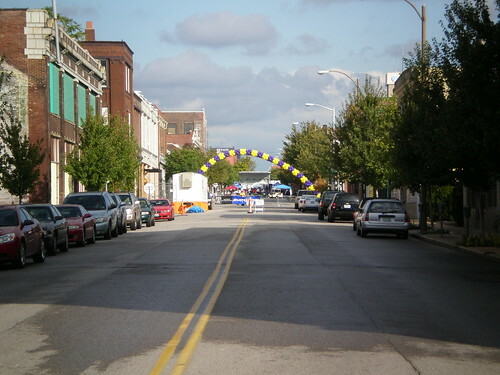 Once known as “Automotive Row” and recently re-branded as “Midtown Alley,” this district has many advantages including its 2005 placement on the National Register of Historic Places. It is centrally located and in close proximity to SLU, Harris-Stowe and Wells Fargo Advisors not to mention Grand Center and existing residents of the immediately surrounding area. 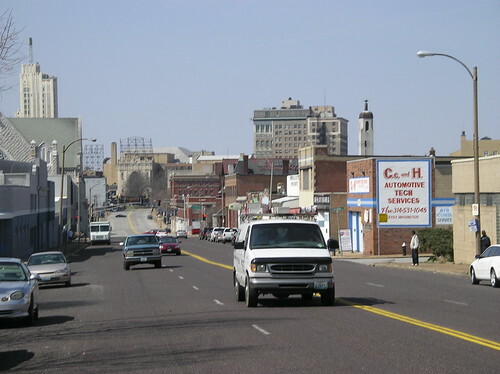 It has a fairly intact built environment with fewer gaps in the street-wall than most of St. Louis and it already had a few churches, residents and many small businesses scattered throughout it (most notably on Washington Avenue which has a Limousine Business, a Sign Maker, Salvation Army Harbor Light, Grand Wig House, several auto-related businesses and more). 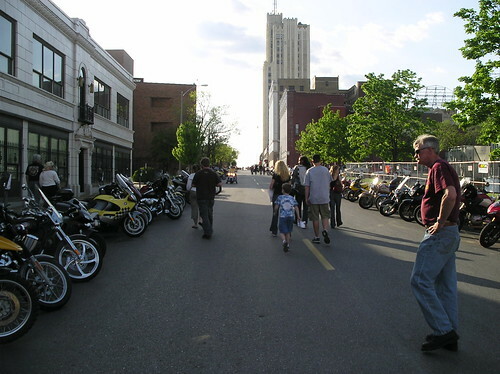 Unlike many concentrations of commercial activity in the city of St. Louis, Midtown Alley is not restricted to one street. 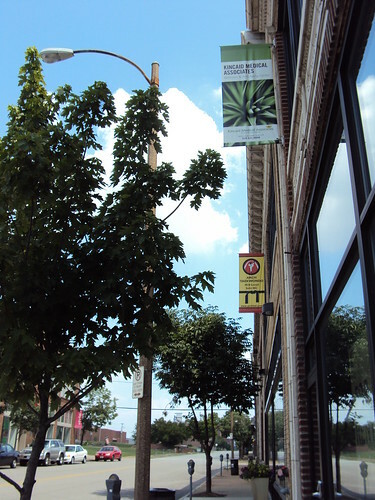 Washington, Locust, Olive and all the streets that connect them are part of this district and each have been benefiting from recent investment. Midtown Alley also has short, walkable blocks (which Jane Jacobs is a big fan of) and an ability to expand in any direction it wants! 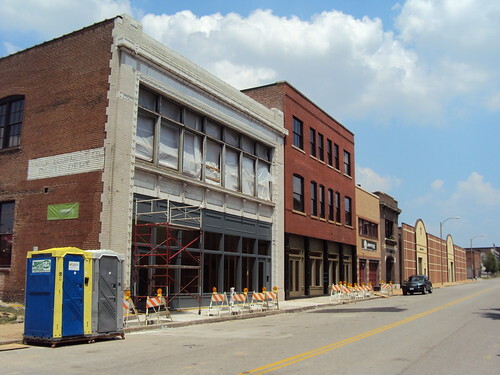 In the last few years the area has improved dramatically, particularly along Locust and Olive Streets. Restaurants, nightclubs, barber shops, residences, offices of professionals and more have made the decision to move into Midtown Alley. There is a motorcycle museum, a tanning salon, a boutique clothing store, a Taekwondo school, a recording studio, a very popular rock venue, the Black Alcohol/Drug Service Information Center, and more. 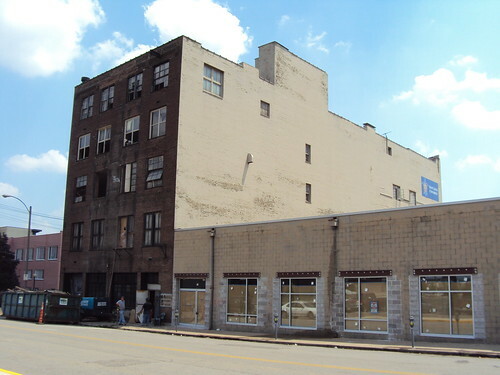 SLU is opening a boutique hotel in Midtown Alley next year and next door on Locust will be a Motorcycle Dealership (SLU had better have a lobby that connects Locust and Olive). Moto Europa coming July 2010, Moto Europa located at 3410 Locust is the latest addition to a true motorcycling destination right here in St. Louis, MO. Attached to the Moto Museum and the Triumph Grill Moto Europa will offer new Ducati and Triumph motorcycles combined with a beautiful state of the art dealership and providing customer service second to none. Opening July 30, 2010. Personally I’m excited. And not as a Motorcycle fan. The transformation this area is undergoing is just incredible. And the best part is that Midtown Alley is not alone. It is just one of many places around the city that people are rediscovering. Areas where people concentrate themselves generate economic and social activity that makes our city a city. 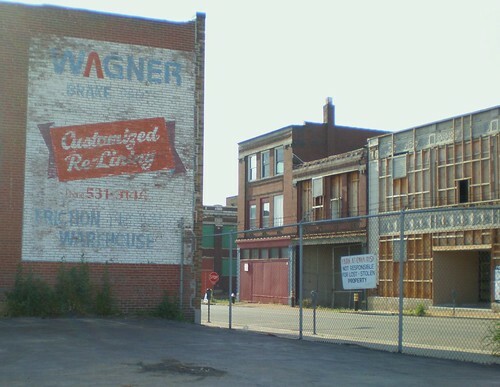 We can never have enough of these places where St. Louis actually looks like a real city and we can really learn a lot of lessons from seeing what works when redeveloping neighborhoods. The slow and organic growth that Midtown Alley has been experiencing has actually been going pretty fast! I commend Midtown Alley and its businesses/organizers for their great work. Pappy’s attracted the New York Times to Midtown Alley (even though they didn’t name drop it) and I’ve been recommended the chicken wings and sandwiches at The U, the pizza at The Good Pie and recommend to others the beer at the Buffalo Brewing Company (and the food). Unfortunately, despite all of the success Midtown Alley has had, it still faces some pretty big obstacles. 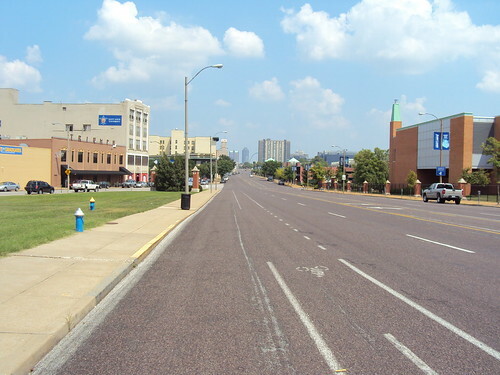 Just like the Loop owes much of its success to Wash U, SLU and Harris-Stowe are key to the success of Midtown Alley. Although they literally touch Midtown Alley, both institutions have turned their campuses inwards leaving fences to face the outside world. Olive Street already suffers from it’s extreme width that discourages pedestrians from crossing it. If SLU were to add street entrances to it’s buildings along Olive and allow students and staff to enter from the inside OR outside of the campus, people would be better able to take advantage of what the school’s prime location has to offer. In addition, the blight of surface parking between Midtown Alley and Grand Center must be addressed. If re-connected, these areas could benefit each other greatly. I recommend driving through Midtown Alley at the very least. While a lot of what it has to offer is still just potential, that potential is still great. More photos of Midtown Alley. Now that would be cool. Maybe a scooter or bicycle shop will come first. 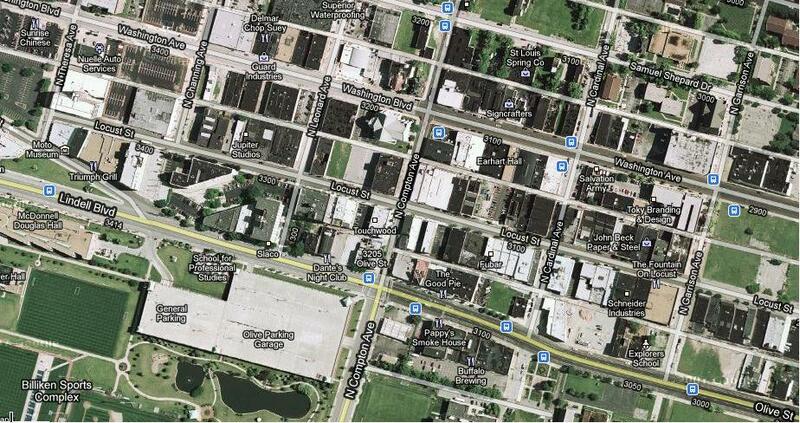 Not to take away from Lewis Place, but if Ranken put their automotive unit there, it’d fit the neighborhood. i went to SLU and recently moved my business into Midtown Alley and have been involved in the branding for about a year, what’s amazing to me is all the businesses that have banded together to take this area to the next level. It’s a true neighborhod effort that should be recognized by the city. Thank you for moving your business here! I think that it’s wonderful you are willing to devote your energy to this wonderful cause. The area has so much potential and is closer to achieving every time someone new enters the equation. Thanks again! Let’s get Midtown Alley added to the Explore St. Louis Signs! I agree. Midtown Alley and Grand Center seem to be the only areas in the city that are continuing development despite the down econemy.